Putting a vibrating object under the icecube tray (or other figure to be frozen) seems to work really well. Play around with different levels of vibration and such, but with very little effort you should be able to get pretty much clear ice. I’ve always wondered about that myself… but not to the analytical extent that you have. Years ago (when ice carvings was just a little bit cooler than it is now), we’d often purchase the huge blocks of ice necessary for carving. The blocks often came in with a ‘feather’ in the middle… or the flat straight section dead center that contained micro bubbles and impurities. If we wanted a clear sculpture, it was necessary to cut out the feather and design a sculpture around that idea. Other companies started to offer (at a higher price) blocks without the feather. I was told that they achieved this by freezing running water… although I never took the thought process further than that. anon: Good suggestion. Does anyone make vibrators fit for clear ice cube production? justin: Yes – they use “cold fingers” (cylindrical metal tips) that are cooled and immersed into water which is circulated. 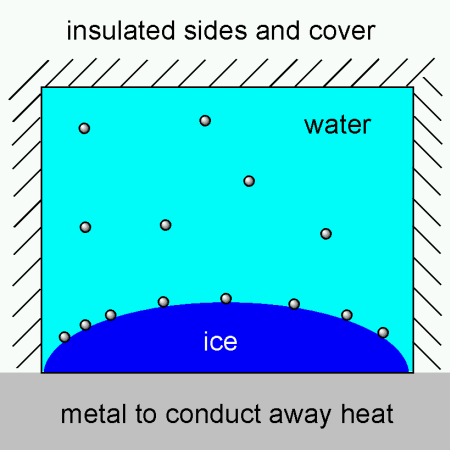 Some models also allow water to freeze at the end of the cold finger, giving cup shaped ice cubes. You can always pick up an old freezer! I had an old refrigerator that used to vibrate a little and noticed all my ice cubes out of the trays were crystal clear. I’ve googled a little and found two several patents on ice cube trays coupled with vibrators! Seems like freezing under a partial vacuum (would take a lower temperature) would help remove dissolved gases. to avoid bad smells it’s even easier to use ice cube bags like this: http://www.campingworld.com/browse/skus/index.cfm?skunum=30314 . in Europe they’re much easier to find, but at least they’re finally available in the US as well. I am working on making very clear ice and have resorted to my Anti-Griddle. I place silicone ice trays filled with distilled water on top of the anti-griddle. The water starts to freeze from the bottom up, therefore giving the bottom a head start, and thusly pushing the air out of the top. Clear as a bell. hi…i am doing some work on a project in which I have to establish laminar flow in a closed chamber which have 5 inlet holes and 5 outlet holes. I am pouring water into the inlets by using a water reservoir and the outlets are open to air.However there are bubbles being formed inside the chamber which are getting difficult to remove.These hinder the flow and dosen’t make the flow laminar.Could anyone suggest a way to remove these air bubbles? If there is any solvent which helps in dissolving air bubbles,it would help. Late, but anyhow: a somewhat related problem that is rather fun is making perfect ice spheres. Reference at food for design (http://foodfordesign.blogspot.com/2008/05/perfect-ice-for-perfect-drinks.html). However, you need some new equipment that has to be stowed away in the kitchen when it’s not used (a common problem in our home). This seems to require that you have a bubble-free ice cube to begin with, though. Here are a few suggestions to reduce your air bubble problem. (1) make sure you are not using cold solutions. more gas can dissolve in the colder solutions (especially aqueous ones). use solutions at room temp or above. (2) what medium are your channels made in? if this medium is hydrophobic (PDMS, plastic, etc), the air bubbles will stick to the sides of the channels, because air is ‘hydrophobic.’ if you have access to a plasma oxidizer, you can use that to oxidize your channels. the bubbles will slide right through and not impede your flow. or you can adsorb a layer of protein on the channel. proteins are (generally) hydrophillic, and will accomplish the same objective as plasma oxidations. I played around with this (using filtered tap water) and got the best results from boiling the water twice. I have posted pictures on flickr. I’ll probably do a bit more playing around. I’d like to try filling only every other cube (in a checkerboard pattern) to see what effect that has on the location of the cloudiness in each cube (I suspect it’ll be focused in a column or cone down the middle), but considering that the water I used came straight off the boil I don’t expect there to be any less cloudiness. I’ll bring some purified water from work to see what effect that may have. I’m wondering how to store ice in a cooler. 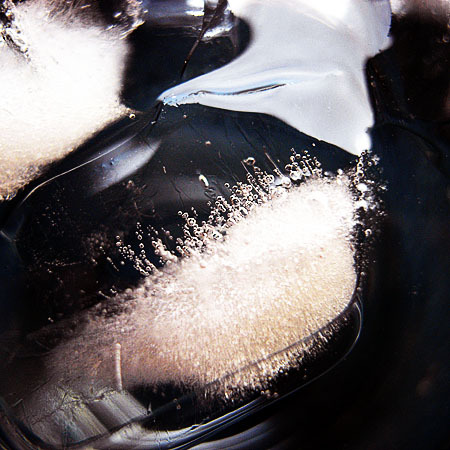 When ice melts in a bag or plastic container it is then surrounded by water – is it better to drain the water and leave the ice “dry” in the cooler or will the water help keep it frozen longer? My guess is that it’s best to drain the water – otherwise it will act as an efficient transporter of heat from the sides of the container to ice cubes. Air on the other hand is a pretty good insulator. You say that particles act as nucleation sites. But don’t you actually want the air to nucleate as soon as possible before it freezes to get it out?